Head this way for fun finds and handmade quilts! Patti and Babs, both clients of Sojourn, are avid volunteers for the Sojourn Garage Sale every Thursday at the St. Bonifacious house located off County Rd 92. 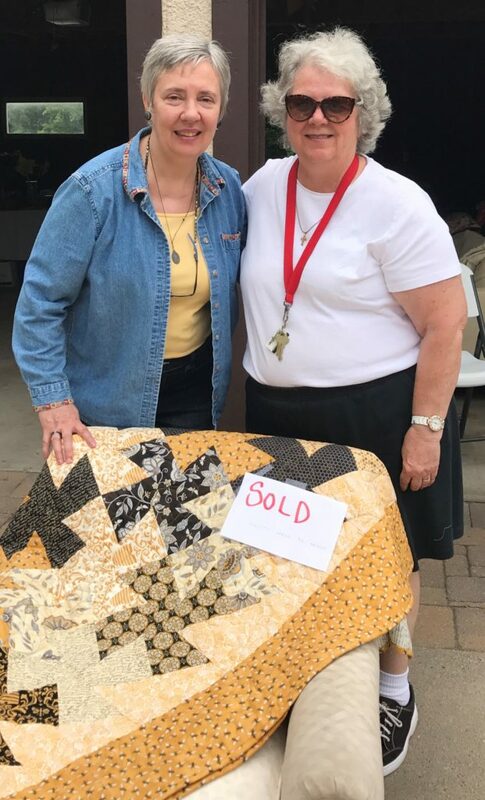 From now through Labor Day (weather permitting), items will range from donated furniture, clothing and décor, as well as handmade jewelry and beautiful quilts from the members of the Sojourn Art Program. All proceeds from the garage sale will be donated to the Sojourn Art Program. These donations are used to provide art supplies, quilting supplies, clay and other items. The Sojourn staff and volunteers have provided an encouraging and creative atmosphere for all to enjoy. “It’s a soothing and relaxing environment, I am learning many new skills and enjoy picking up new hobbies,” states Babs. Jane, a caregiver for Sojourn Suites, is also an artist-in-residence for the art program every Monday and assists with the garage sales. Ms. Kay is one of the wonderful volunteers, who helps collaborate and assist with quilting projects. With a background of running her own quilting studio, her passion and talent are much appreciated! “I love participating in the Art Program. We quilt, cross stitch, crochet, knit, embroider, sew, paint, color, create clay sculptures and pottery,” explained Patti. This is the first year for Sojourn’s garage sale and it won’t be our last. All donations are welcome! Open 10am-4pm every Thursday through Labor Day. Stop by, say hi and pick up a new treasure! Special thanks to all in the community for your continued support!